Seven artists, James Aldridge, David Batchelor, Rowena Dring, Cornelia Parker, George Shaw, Shahzia Sikander and DJ Simpson created new site specific works for The London Breast Care Centre located in the West Wing at Barts Hospital in London. The new centre opened in autumn 2004. 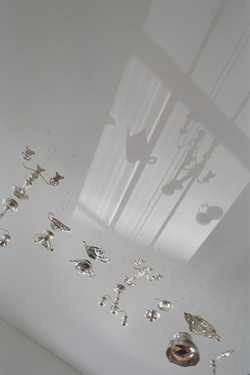 Cornelia Parker - Still Life with Reflection, 2004. First Floor waiting room, West Wing, St Bartholomew's Hospital. Vital Arts, the arts programme for Barts & The London NHS Trust commissioned Field Arts Projects and Highwood Research to undertake a research study of staff and patients at the West Wing. The staff and patient research findings were intended to provide a comprehensive understanding of the impact of the West Wing’s environment and artworks on the provision of breast care services at Barts and the London NHS Trust. The main research objective was to determine how, if at all, environment affects personal and professional wellbeing in the delivery of healthcare. Download the report as an Adobe Acrobat document, 129KB.